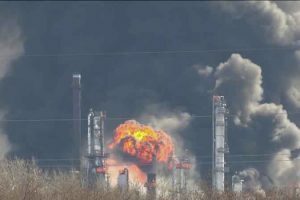 A massive refinery fire at the Puma Energy facility on Nicaragua’s Pacific coast has contaminated sensitive nearby coastal habitats, according to local reports, with an oil slick contaminating half a square mile of water and soil. The fire, which started on August 17, consumed the contents of two of the refinery’s four huge fuel tanks at Puerto Sandino, some 70km northwest of the capital Managua. Surrounding beaches are home to important nesting grounds for several turtle species, while the coastline nearby produces 12% of Nicaragua’s salt. A huge plume of acrid smoke at one point billowed up to 3km from the disaster scene, but has largely dissipated, local media said.